Explanation: Is Leo leaking? Leo, the famous sky constellation visible on the left of the above all-sky photograph, appears to be the source of all the meteors seen in 1998's Leonids Meteor Shower. That Leonids point back to Leo is not a surprise - it is the reason that this November meteor shower is called the Leonids. Sand-sized debris expelled from Comet Tempel-Tuttle follows a well-defined orbit about our Sun, and the part of the orbit that approaches Earth is superposed in front of the constellation Leo. Therefore, when Earth crosses this orbit, the radiant point of falling debris appears in Leo. 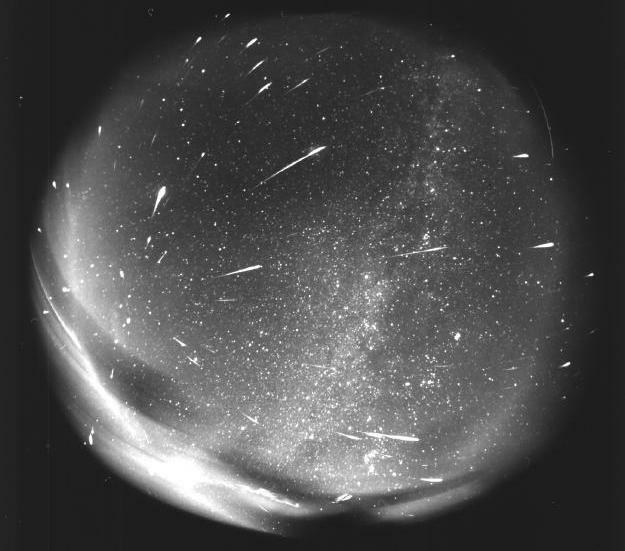 Over 150 meteors can be seen in the above four-hour effort. The Leonids Meteor Shower of 2003 is expected to have two peaks, the first three days ago and the second a long-duration peak covering much of November 19. Although visible meteor rates might approach one per minute, they are predicted to be much less than in the previous few years.